Dean Barnitz, a modern-day “Betsy Ross,” sits at her sewing machine. Flags fly at full staff for Independence Day. John Hood, Sam VanMatre and Steve Van Meter raise the flags. POMEROY — Some might call her a modern-day Betsy Ross as she sits at her sewing machine, mending and reinforcing flags for VFW Post 39. Dean Barnitz has been sewing for more than 80 years, and when asked why she mends the flags, she says she likes to sew. Her sewing machine sits neatly in the corner of her dinning room, near a bright window filled with African violets in full bloom. She first learned to sew around 1932, when she took classes at Racine High School. She began helping VFW Post 39 with the flags when member Joe Strubel asked her one day during church if she could assist them. The flags are expensive and not well reinforced when they are received by the VFW. Barnitz’s efforts not only mend torn flags, but with her sewing expertise she is able to reinforce the flag edges to prevent tearing. Several family members have served in the military, including her husband, an World War II Army veteran who was stationed in the Philippines and Japan. She keeps his discharge card in a basket on her desk. She recounts that her brother was with the 8th Air Force in WWII and her son traveled the world as an Army military police officer in the 1960s. “I like to keep busy,” she said, “and help the VFW. The flags Barnitz mends are displayed on the left of the entrance to the Bridge of Honor, also known as the Pomeroy-Mason Bridge. 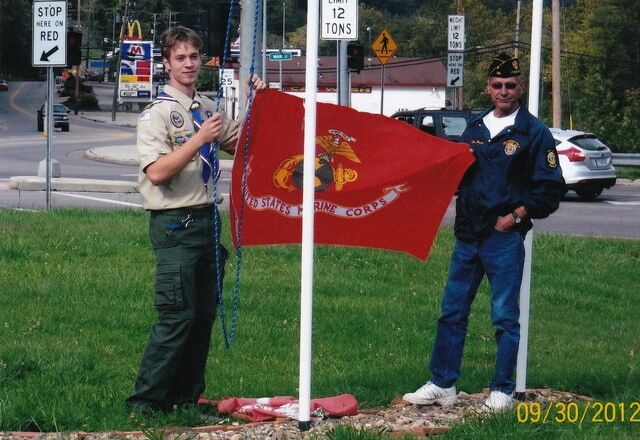 Credit is given to Marshall Aanestad for the idea and building of the flag pole display as an Eagle Scout project. The project was completed in September 2014 and features three-foot by five-foot flags. All branches of the U.S. Armed Forces are represented, including Army, Navy, Air Force, Marine Corps and Coast Guard; a POW/MIA flag is positioned among them. The state of Ohio flag hangs on a pole just under the Stars and Stripes. VFW Post 39 agreed to maintain the flag display and the village of Pomeroy is responsible for the grounds. According to John Hood, Post 39 commander, the wind is damaging to the flags. Currently, the flags fly during holidays, including Memorial Day, Fourth of July and Veterans Day. At least two sets of flags would be necessary each year if the flags were flown more often. Barnitz is quite modest about her contribution. “What I do really isn’t much,” she said. VFW Post 39 members disagree and say that without her assistance, keeping their flags flying would be even more expensive than it currently is. Post 39 members Steve Van Meter, U.S. Army, and Sam VanMatre, U.S. Marine Corp, nod in agreement as they assist Hood in raising the flags for the Fourth of July weekend. The community can become involved to keep the flags flying by making donations directly to VFW Post 39.